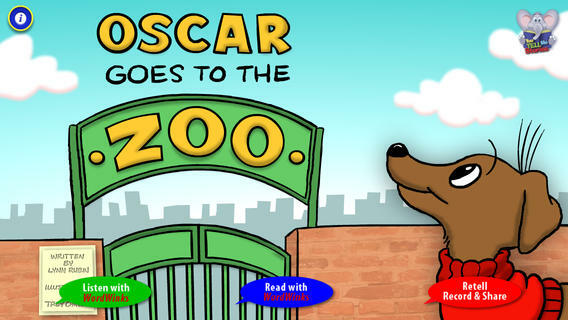 FREE for a limited time – Oscar Goes to the Zoo, a “You Tell Me” story. In this story, a cute little dachshund goes to the zoo and wonders what it might be like to be the different animals that he sees there. In the end he discovers that he likes being himself. Cute story! “You Tell Me” stories are designed with some special features: 1. They incorporate WordWinks into the story. WordWinks are questions and comments written in red italics. To maximize children’s understanding of the story, teachers often add comments/questions as they read aloud. WordWinks are meant to model that teacher voice. 2. They have a “Retell, Record & Share” section. Kids are asked to order 4 scenes from the story then record their own version of the story to share with grandparents or friends. 3. If you register, you can receive a FREE Oscar Goes to the Zoo activity book by email.